This Otorimonogatari: Nadeko Medusa set contains episodes 1-4 plus a deluxe booklet and pinup postcard set. Nadeko encounters a giant snake who claims to be a deity named Kuchinawa. Kuchinawa promises Nadeko that he will grant her wish if she aids him in the search of his object of worship. Little does Nadeko know that obtaining the object of worship will cost her more than what she expected. Koyomi tries to convince Nadeko to let go of the object of worship, but it's too late, and Nadeko swallows the object and becomes a snake apparition! To make things worse, now Nadeko wants to kill Koyomi and Shinobu Oshino! 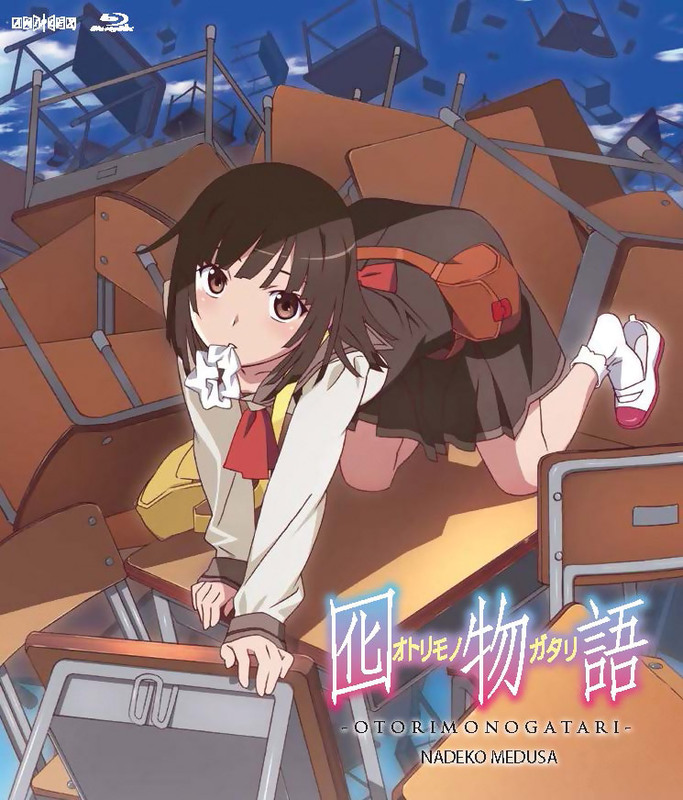 Third arc of the Monogatari series' second season. Special Features: "Omnibus 3" Video, Textless Opening & Ending, Promotional Video & Commercial Collections. A great release for my favorite Monogatari arc! I'm constantly astounded at how well put-together the Monogatari series is on the whole, but this arc takes the cake for me. The pacing and dialogue are perfect, the story is compelling and thought-provoking, and the arc really adds an amazing amount of depth to Nadeko's character that was much-needed after her brief appearance in Bakemonogatari. Apart from being an excellent adaptation of Nisio Isin's original work, the visuals unique to the anime also contain a story of their own, filled with the dense, abstract symbolism and emotional tones we've come to expect from this series. This is my favorite arc in the entire series, which is saying a lot considering I have yet to find ANY arc in Monogatari that isn't executed brilliantly. This blu-ray release includes some really nice post card art as well as nice case and disk art. Disks are easy to get out and everything is separated well into chapters by scene. Since I've starting collecting this series I've had to buy each item one at a time since if you want to own the whole series it will be expensive. What this comes with is good quality and I am a fan of the style that the boxes have when you have them all lined up together. Only reason for me that this doesn't get five star is price point, but that is to be expected of anime at this point.